Protank offers carbon steel, stainless steel intermediate bulk containers (IBCs), galvanized steel double walled oil storage tanks, and stainless steel water tanks. Tank construction is carbon steel, stainless steel, or galvanized steel depending upon application and tank type. Protank provides steel tanks for storage and transport of liquids and chemicals, for storage of oils, fuel, and for holding water or rainwater. These tanks have residential, commercial, and industrial uses. Capacities, dimensions, and applications will vary based on the specific steel tank. Carbon steel and stainless steel IBCs are effective in the transport and storage of oils, lubricants, and many various chemicals. Protank’s steel IBC totes see industry use for food, chemical, petroleum, and pharmaceuticals. Capacities are available from 110 gallons to 550 gallons with 1.9 specific gravity ratings for chemicals. All Protank’s carbon steel and stainless steel IBCs meet Title CFR49 requirements, hold UN31A and UL142 design approvals, and are NFPA 30 section 9.4.1 (1) approved for flammable and combustible liquids. Galvanized steel double wall tanks can be used for heating oil, motor oil, DEF, ATF, diesel fuel, and bio fuels up to B20. These tanks are constructed of an inner, seamless, blow molded high density polyethylene that is contained by a weld free galvanized steel tank designed to hold 110% of the interior tank volume for maximum spill protection. Protank’s double walled steel storage tanks are leak proof, durable against physical impact, and chemically corrosion resistant. Stainless steel water tanks are offered for long term bulk water storage and use. Principal uses include storage for rainwater, well water, storm water, and fire protection systems. The sourced water can be external or internal as with rainwater collection. These tanks are highly effective in storing rainwater capture. Protank’s stainless steel water tanks are available in a wide range of heights, diameters, and gallon capacities to meet custom, individual, and specific application needs. Storage is available from 12,000 gallons to exceeding 100,000 gallons. Each steel water tank is internally lined with FDA certified food grade flexible polyethylene designed per NSF / ANSI 61 requirements for potable water systems. The interior lining is resistant to damage from mechanical impact, ultraviolet light, and chemicals. These tanks have various additions, components, and fittings that can be modified based on its specific use. 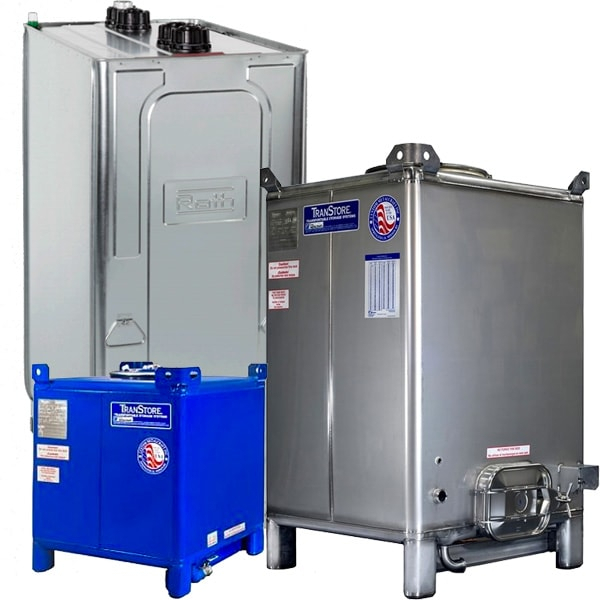 Protank’s steel tanks do offer some customization options based on individual needs. Warranties are available but vary with product. Contact Protank about customizing steel tank options, compatible chemical concerns, or for more information on steel storage tanks.